Who Will Win the 28th T20 Match, Between TKR vs BAR and Toss Prediction? Where Can You Watch the Live Streaming of TKR vs BAR, 28th T20 or Channels to Watch? 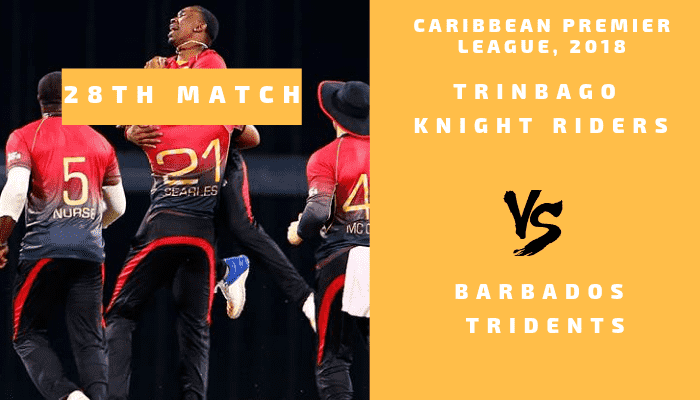 Trinbago Knight Riders is all set to take on Barbados Tridents on Saturday, September 08, 2018. In Today’s Dream11 Fantasy Cricket Match of TKR vs BAR 28th T20, CPL 2018, we will cover Pitch Report of Queen’s Park Oval, Port of Spain, Trinidad, Predicted Playing 11, Toss Prediction, Fantasy Cricket News and Tips and Who Will Win? You May Like to Read Today CPL Match Prediction. Trinbago Knight Riders have played 8 matches, won 6 and lost 2 matches. They are at the 1st position in the points table with 12 points in their pocket. On the other hand, Barbados Tridents has played 9 matches won 2 and lost 7 games. They are at the 6th position in the points table with 4 points in their pocket. According to our astrology prediction, TKR will win the match. The team winning the toss should opt to bat first as chasing will be comparatively difficult on this ground. According to our astrology prediction, BAR will win the toss and invite TKR to bat first. Date: The match will be played on the 8th of September 2018 (Saturday). Match: Caribbean Premier League, 2018, TKR vs BT, 28th Match. Venue: Port of Spain, Trinidad, Queen’s Park Oval. Time: 12:00 AM GMT, 06:00 AM IST, 08:00 PM LOCAL. Four matches have been played so far on this ground in this season of Caribbean Premier League, 2018 and two games witnessed 200+ scores. Yes, you guessed right! The pitch will be batting friendly. The batsmen will enjoy batting on this ground as the ball will travel and the batsmen can easily play on the rise shots. The bowlers can only take advantage of the pitch if they ball in the right area. Fantasy Cricket Tips: Try to take quality batsmen and bowlers in your team as the pitch is expected to be a bowling-friendly. The dew may come into play in the second inning. It will be partly cloudy and mostly cloudy in the morning. There is no sign of rain. The weather is predicted to be mostly clear at the time of the play. A hot and humid day is predicted. The temperature is expected to be 27-Degree Celsius and the humidity to be 86%, which may rise up to 92%. Note: The weather condition will support the Seamers in the initial couple of overs. The statistics of the last five matches is the same as the performance of Barbados Tridents this season in CPL. In the last five matches, TKR won four matches out of five matches whereas BT has managed to win only one game. In the last encounter, TKR defeated BAR by 4 wickets with 21 balls remaining. BB McCullum and DJ Bravo were the key performers of that match. Colin Munro, Dwayne Bravo, Brendon McCullum, Darren Bravo and Fawad Ahmed are the key players of Trinbago Knight Riders Team. Chris Lynn playing chances are high. Khary Pierre replaced Anderson Phillip in the previous game. He will retain his place. Colin Munro, Chris Lynn, and Brendon McCullum will lead the batting department and Anderson Phillip, Fawad Ahmed and Ali Khan will lead the bowling department. Colin Munro is the most valuable player for Trinbago Knight Riders Team. TKR has won their last four games back to back. Trinbago Knight Riders may try and make a couple of changes in their team as they have already secured their place in the playoffs. Dwayne Bravo (c), Denesh Ramdin (wk), Colin Munro, Brendon McCullum, Javon Searles, Ali Khan, Sunil Narine, Chris Lynn, Anderson Phillip/Khary Pierre, Fawad Ahmed, Darren Bravo. Dwayne Bravo, Brendon McCullum, Colin Munro, Anderson Phillip, Chris Lynn, Amir Jangoo, Denesh Ramdin, Fawad Ahmed, Darren Bravo, Kevon Cooper, Javon Searles, Hamza Tariq, Sunil Narine, Nikita Miller, Ali Khan, Shannon Gabriel, Khary Pierre, Terrance Hinds. Nicholas Pooran, Jason Holder, Mohammad Irfan, Hashim Amla and Shai Hope are the key players of Barbados Tridents Team. Jason Holder will lead the BAR team. Dominic Drakes has been given a chance in the previous match but he failed to capitalize on it. He may be dropped today. Barbados Tridents Team played with three changes in the last match and it is predicted that they will make a couple of changes today also. Shai Hope will lead the batting department and Mohammad Irfan will lead the bowling department. Dwayne Smith, Mohammad Irfan, Hashim Amla/Guptill, Nicholas Pooran (wk), Wahab Riaz, Shai Hope, Sunny Sohal, Roston Chase, Jason Holder (c), Raymon Reifer/Chemar Holder, Imran Khan. Hashim Amla, Dwayne Smith, Martin Guptill, Sunny Sohal, Ashley Nurse, Nicholas Pooran, Dominic Drakes, Shai Hope, Wahab Riaz, Roston Chase, Raymon Reifer, Jason Holder, Tion Webster, Imran Khan, Shamar Springer, Mohammad Irfan, Chemar Holder. Conclusion: This is it for Today’s Dream11 Fantasy Cricket Match Prediction of TKR vs BAR, 28th T20 Match, which will be played on Saturday 8th September. We have covered all the details required to win any fantasy leagues. We have covered players recent and past performance, dream11 guru and crictom prediction, all the latest news and updates of Trinbago Knight Riders Team and Barbados Tridents Team, weather report of Port of Spain, Trinidad, dream 11 best teams, keys players, the best choice for captain and vice-captain, where to watch the live match of BAR vs TKR, 28th T20 Match and the details of live streaming of Caribbean Premier League (CPL), 2018.